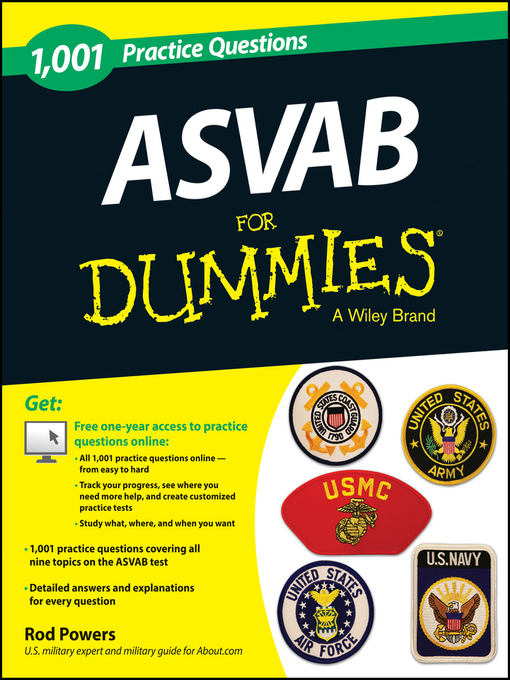 1001 ASVAB Practice Questions For Dummies takes you beyond the instruction and guidance offered in ASVAB For Dummies, giving you 1,001 opportunities to practice answering questions on key concepts for all nine ASVAB subtests. Plus, an online component provides you with a collection of additional problems presented in multiple-choice format to further help you test your skills as you go. Whether you're looking to enter the military or are interested in raising your score to attain a new job, position, or advance in rank, 1,001 ASVAB Practice Questions For Dummies has you covered. Note to readers: 1,001 ASVAB Practice Questions For Dummies, which only includes question to answer, is a great companion to ASVAB For Dummies, 3rd Edition or ASVAB For Dummies Premier PLUS which offers complete instruction on all topics tested on an ASVAB exam.